This is genuinely one of the most unsettling books I've ever read in my life - and I loved it. I got it off Netgalley, so thank you to Penguin for granting it to me. I had actually got an email fron Netgalley about the book, and although I usually ignore those things, the blurb about this book got me so intrigued that I immediately requested the book and then, unusually for me, immediately read it. So the basic premise is that the world has ended. Our protagonist is Jon, an American, who's at a conference in Switzerland when nuclear war breaks out. Washington is taken out, and then more and more of the big cities. People flee the hotel he's staying at. Clouds of radiation start to form everywhere; the sun never breaks through anymore. 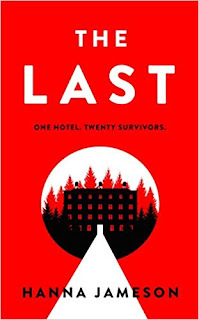 Jon ends up in the hotel with around twenty other survivors. Several are members of staff, and between the twenty of them are a couple of Americans, some Germans, some French, some Japanese people. They're not sure how many other survivors there are around and they decide the best thing to do is to hunker down and survive. Jon volunteers for a bunch of things around the hotel, mostly to keep himself busy and to stop himself thinking about his family. He doesn't know whether his wife and daughters survived in San Francisco or not, and he's driving himself a bit mad with all his regrets. The story of the end of the world would be interesting enough by itself, and indeed, it made me think a lot about the type of person I would be in that kind of crisis. Honestly, I don't think I have much of a survival instinct so hunkering down in a hotel is probably what I'd do. One of my other favourite books about the apocalypse is Station Eleven by Emily St John Mandel, where a flu epidemic wipes out most of the population. Here it's nuclear war, and I liked to read the things that were similar and things that the authors had imagined differently. I think one of the main things would be medical issues, which are highlighted in The Last. We're so lucky to just be able to buy painkillers over the counter and access antibiotics when needed, and those things run out fast. Jon is an unreliable narrator for sure, and he's not always the most likeable of people either. I felt like the ending was a tiny bit unresolved for me, but I also think that it was how a book of this nature had to end, because the world itself was ending. How hopeful could it be? I really recommend the book, I thought it was really well done and compulsive reading, I couldn't stop reading! It's out in January 2019. I'd definitely read something else by Hanna now! I Passed My Goodreads Challenge!